A PIECE OF THE MAGIC! "ALL YOU NEED IS FAITH AND TRUST ..
AND A LITTLE PIXIE DUST!" True ownership of one share of Disney stock framed like you want. The recipient becomes a real shareholder of the company. 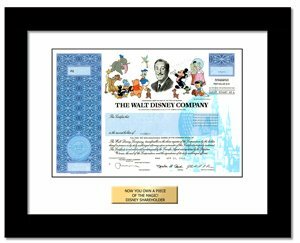 The intricate certificate is a replica of Disney's authentic stock certificate design from when they did issue paper. It was a highly sought after collectible for many years. It is one of the most ornate stock certificates around, showing the Magic Kingdom, many of the Disney characters and Walt Disney himself. The Walt Disney Company is a worldwide entertainment company most known for their Disneyland and Disney World theme parks. The company also owns ABC, ESPN, Disney Channel, Marvel, Pixar, and now Lucas Films.